because you loved them and I want to believe in an afterlife. You knew they were more than forgotten road kill. You made ceramic banks, mugs, and bowls in their image. will you return as an armadillo? curved, plated, sturdy, but also, I think, soft. I hadn’t seen one – a live one – in twenty years. I saw one, on the night you died, illuminated by Mum’s high beams. I asked if he was real. because I thought your death would convince me to believe. So I believe in armadillos. I walk into the forest and sit and wait. and I know they will come. and I know they will come to me. I ask each one, “Is it you?” but they don’t respond. I see a roll: many humps with twinkling eyes and pointy snouts. After your death, I look for armadillos. Georgia Knapp travels the world looking for stories to tell. Her works can be found in The Huffington Post, The Purple Fig, Gravel Magazine, and the Georgia Writers Association’s Exit 271. She lives in Bangkok, Thailand. Photographer’s Note: This poem taught me a few things: A pantoum is a form of poem with repeating lines, a style I find intriguing. Secondly, I learned the way my brain works may be a little weird. When I initially read this poem, I thought, “How am I going to capture what this poem embodies? ?” Somehow, I arrived at this photo and I hope I did it justice. 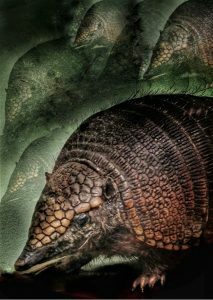 I HAD to use a photo of an armadillo. I repeated the image in the background to represent not only a pantoum but also the plurality of armadillos in the poem. The varying degrees of exposure depict the fluctuating memories from recent to long ago, the real v. imaginary thoughts and a sense of an afterlife all rolled into one.